Measuring the effectiveness of email marketing is largely done by tracking actions associated with link clicks in the email itself. In order to do that the links in an email need to be tagged with what are called UTM (Urchin Tracking Modules) parameters. Urchin is the software company that pioneered this kind of tracking and was bought by Google in 2005 to become Google Analytics. UTMs have been used to segment, track and measure various digital marketing campaigns for over 15 years. If you’re using Google Analytics, there are 5 different tagging parameters that you can append to URL links that can used for tracking and reporting. Each of the parameters answers a different question about the origin of the click. 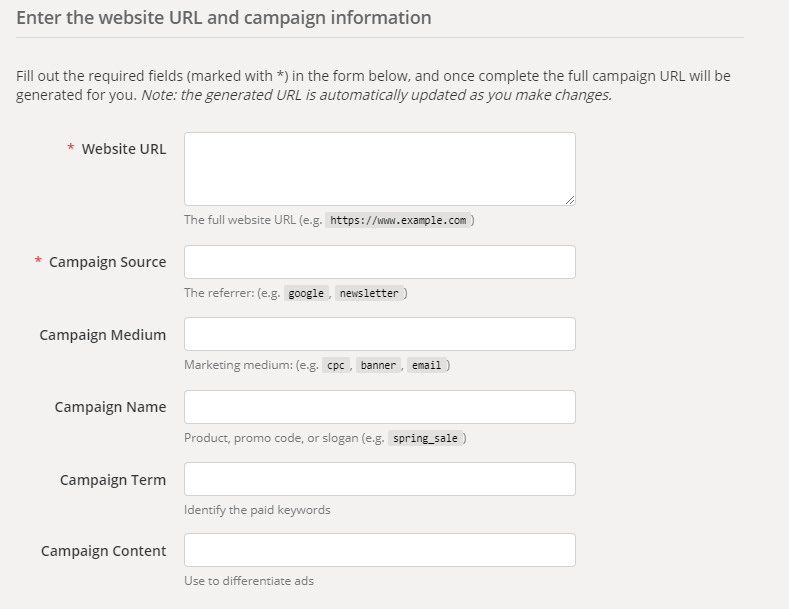 Google’s URL builder, shown below, provides a form where you can enter each of the UTM paramters and generate a properly tagged URL for tracking your email link clicks. Source: This is the “where is the traffic from” parameter. For non-email campaigns, this would usually be a website or platform like Google or Facebook. For email campaigns, however, you can use this parameter to identify the particular audience segment: “New Subscribers”, “Top Buyers”, “Abandoned Cart”, etc. Alternatively, you can use “internal”, to indicate that this is internally generated traffic. Medium: This is the “what kind of traffic” parameter. For email campaigns, it should be set to “email” as the default, regardless of the other parameters being appended. Campaign: This is the “what kind of content” parameter. This is specific to the content of the email: not the audience or the medium itself. This could be anything from “New Year’s Resolutions 2018” to “Buy One, Get One Offer” depending on how your email campaign is labeled. If it is an email to your blog subscriber list, you might want to use “Blog”. These three parameters are the bare minimum needed to effectively track email marketing efforts. For most bread and butter campaigns, they’re useful and meaningful. However, there are two other UTM parameters that can be appended to email link URLs that offer more creative and precise tracking capabilities; those are Term and Content. These are optional parameters that have other uses in non-email campaigns, but for email they can be used to track more granular data. For example, if multiple links to the same URL are embedded in the email, which was one clicked: the one closer to the top or the bottom? Was it an image or logo link or a link built from specific words/CTAs. These parameters are not needed, per se, but do allow for advanced A/B testing, audience refinement and performance segmentation. The Content parameter can be used, for example, to give more specific information about the email contents. For example, if you are using Campaign = “Blog”, you can set Content to the title of the blog post, so you can easily track which posts generated the most email clicks. When it comes to tagging you don’t have to go it alone or attempt to do it manually because there are easily accessible technology solutions. Most major email marketing platforms like MailChimp and Constant Contact have built-in, out-of-the-box tagging capabilities. There’s also Google’s URL builder and a variety of boutique parameter appending solutions out there as well. 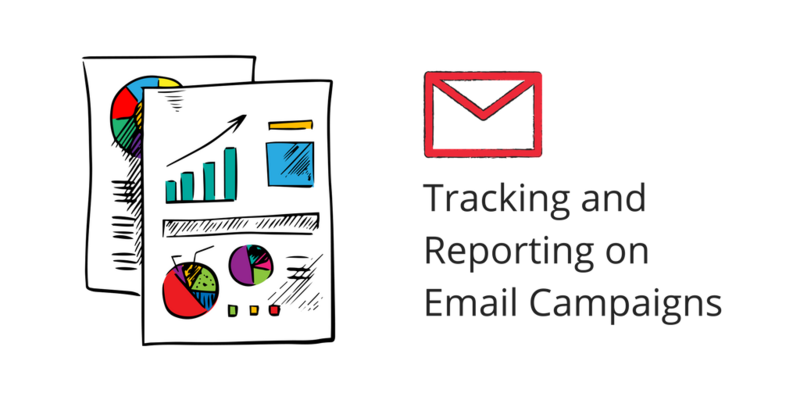 There are a variety of email marketing metrics you should be measuring and reporting. Some are tied to the broader medium of email itself while others are more granularly tied to the specific email campaigns being run. Some of these metrics are available directly within the email marketing platform, while others are better sourced from a full-featured analytics platform like Google Analytics. We recommend using both the data from your email platform data as well as Google Analytics. Native email platforms have great deliverability data, but less refined conversion level data. Conversely, Google Analytics can track an inbound click from a landing page to a shopping cart, but it’s not going to give you reasons for email bounces. As strong proponents of integrated reporting, we’d suggest that a degree of data redundancy and overlap are perfectly fine. Moreover, extreme variance between data providers might be a strong clue that something isn’t quite set up properly. Email marketing reports should cover 3 broad areas: Email List Health, Email Deliverability, and Email Engagement. Email list growth rate: What is the overall trend for the audience size? Over a period of X days, how many new email contacts were added (Y) and what % of the total list size does that represent (Z)? Be careful with what you take away from this though. Raw email list size can also be a vanity (and hence, misleading) metric, as we’ll elaborate below. But as email marketing efforts within an organization mature the email list size will grow. You need to measure that growth. New subscribers by source: New email contacts are great but don’t just lump them all together without any kind of segmentation. Some organizations use email for digital marketing, but they acquire most of their emails offline – at conferences, for example. Subscribers by source helps to keep track of how new emails are being acquired. Our advice? Segment, segment, segment. Email campaigns are often used to nurture leads that have already cost money to acquire in other mediums. So, if you want to have a full picture of how email compliments and supports other marketing channels, and multi-channel user journeys, you must distinguish the original source of the email. This might be a subscribe button on a website, an in-store point-of-sale offer, or a post-tradeshow file upload. The source of the subscriber is as important to understand as the new subscriber rate. Engagement Distribution: What share of the email addresses belong to recipients that could be classified as active, unengaged or unsubscribed? There’s little value to having 10,000 emails in a list when only 1,000 of them are actively engaging with your content and offers. Over a 90 to 180-day period, take a look at who hasn’t clicked through a single link from all the emails sent. Even if they haven’t unsubscribed, you might consider purging them yourself. Or, at the very least, moving these addresses over to a new email audience segment for a re-engagement campaign. Actively attempting to re-engage dormant subscribers might involve a different kind of content, a more enticing offer or altogether new messaging. Again, raw list size might not be the most telling metric here. But regardless of your list size, having 50% to 60% of recipients actively engaging with your content is indicative of a fairly healthy list. Bounce Rate: How many emails were unable to be delivered relative to the total number of emails sent? If you have below a 2% bounce rate, that is well below most industry benchmarks. If it’s anything above 5% to 6%, however, you will want to look further into the data accuracy of the emails to see if there are any trends to the bounces. For example, email size caps, full mailboxes or IP or domain blacklisting. Don’t put too much stock in open rate alone. Open rate can be another, often-misleading, vanity metric. Some emails and platforms only report an email as opened when images load, for example. Some email clients will technically deliver an email (no bounce), even when it is relegated to a Spam folder. So it can be a hard metric to accurately determine when some were opened but not reported and others had no chance of ever even being seen, never mind opened. There are better, more reliable, metrics for engagement. Click-Through-Rate: This is the percentage of emails sent that resulted in a recipient clicking on a UTM link. The beauty of links appended with a UTM code is that there is far less mystery about what did or didn’t happen. If the recipient clicks on a link, it loads a very specific URL in their browser, and an analytics solution can now track the rest of that onsite activity and engagement. Click through rates will by nature be lower than any reported “open rate” for emails, but it’s a far more useful metric for reporting on how engaged or prompted to action the recipients actually were. Click-To-Open Rates: This measures clicks to total opens (and not just deliveries). This metric helps clarify the impact of the actual internal content. For example, imagine emails A and B are both sent to 200 people. Email A got 10 clicks and Email B got 7. On the surface, email A had a stronger CTR. However, if we also learned that email A was opened 100 times and email B only 50, our perception of the email’s actual content would change. Despite having fewer opens, email B was actually a more engaging piece of content. Email A had 10 clicks from 100 opens (10% CTOR) but email B had 7 clicks from 50 opens (14% CTOR). This more refined metric is going to provide different insights. This data suggests that email B has a greater overall impact. Perhaps with a different subject line it could see more opens and potentially generate more clicks. In this way, CTOR can help you assess subject line performance vs internal content performance. Conversions: Once a parameter appended URL loads in a recipient’s browser you can track the rest of their activity. From here you’ll want to treat email like any other channel and measure conversions. This could be actual sales or just further micro-conversions that allow you to nurture a lead further down the funnel. But if you’re measuring dollar for dollar ROI you will need to attribute some monetary value to the campaigns and for that, conversions are your best start. Email Forwards or Shares: The value of this metric is like other social media metrics that measure “amplification”. While marketers spend considerable time and money trying to acquire new emails and audiences, the simple act of forwarding or sharing the email content might be the among the most valuable lead generation sources out there. When recipients forward or share email content they widen the audience for you and in doing so, append a layer of social proof to what’s in the email. This can help drive the acquisition of new emails and foster additional conversions or sales from non-original recipients. In this sense email forwarding and sharing is a very specific type of referral channel. If you are using both native email marketing platforms in conjunction with a dedicated analytics solution, you should have all the basic data and tools you need to really start optimizing and refining your email marketing efforts. Over time you’ll be able to better situate and successfully leverage email as an ongoing part of your multi-channel marketing strategy.